With all the berries looking so appealing last week, I stocked up on strawberries, blackberries, raspberries and blueberries. A little too much, I guess, since I couldn’t use all of them. So into the freezer with a portion of each. So today, I thought I’d try to make an iced dessert to use them. This one combines strawberries, raspberries, and a few blackberries. I bet blueberries would be good in it too. It came out very tasty, with only healthy ingredients. I used stevia instead of sugar, so it was also a low calorie treat. It’s lovely to have a light, icy dessert to enjoy on a warm sunny day! Plus it’s much healthier than ice cream. Berries are one of the top foods for brain health too. They pack so many nutrients that are beneficial when eaten fresh, frozen or dried. High in vitamin C, calcium, phosphate, magnesium, folate and potassium, berries are low in calorie besides. Strawberries only have around 50 calories in a whole cup. The Nutrients vary with each berry, but vitamin C is high in all. The flavanoids in berries strengthen brain connections. They also serve as what they call housekeepers in the brain, helping to maintain the brain and stop decline that is normally seen with aging. If you’d like to read more about the best brain foods, you can check out the article, Top Foods for a Healthy Brain. 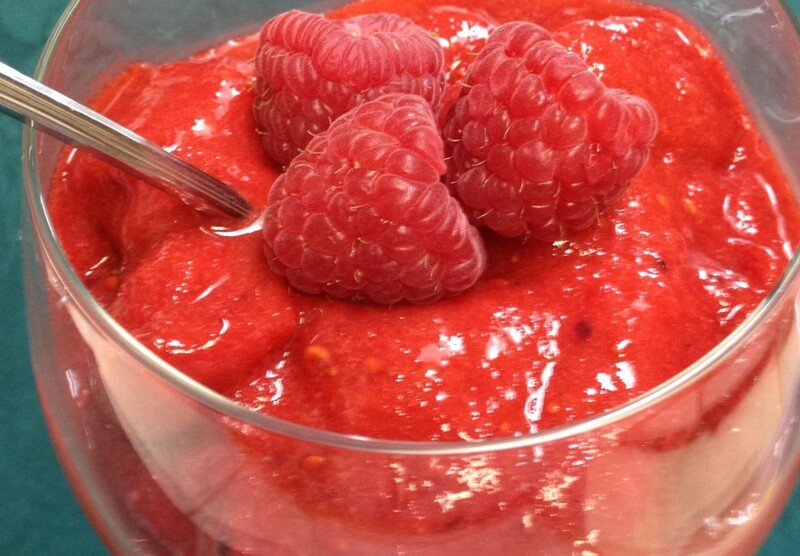 Combine berries, sugar and juices in a blender until smooth. Pour into dish, then freeze for 1 hour. Stir, then freeze 2 or more hours. When ready to serve, run through blender again for 2 minutes until smooth. Ninja QB1004-FS Master Prep Professional. Seems like I am always singing praises for this terrific, effective small appliance. It’s what I use for all slushes and ices, not to mention nearly everything else. You can read my review of it at the link above. You can see the double blades in the photo before. It is so much more efficient with the two blades, one several inches higher than the other. Compared to the old fashioned blenders with the single blade at the bottom. It works so much faster (takes only seconds for nearly any task), and is far easier to scoop out the finished product since you can simply pull the blades straight out. That also makes for easier and more thorough cleaning. It is still amazing me. Whatever I try in it works fast and well. I can’t wait to try some of the iced desserts featured here. They look so refreshing. It’s always a treat to have a frozen dessert, but since ice cream is so high in fat and calories, we tend to avoid that. Ices and sorbets are the perfect solution for that. 160 pages of tasty treats, from pear sorbet to espresso flavors. Something for every taste!